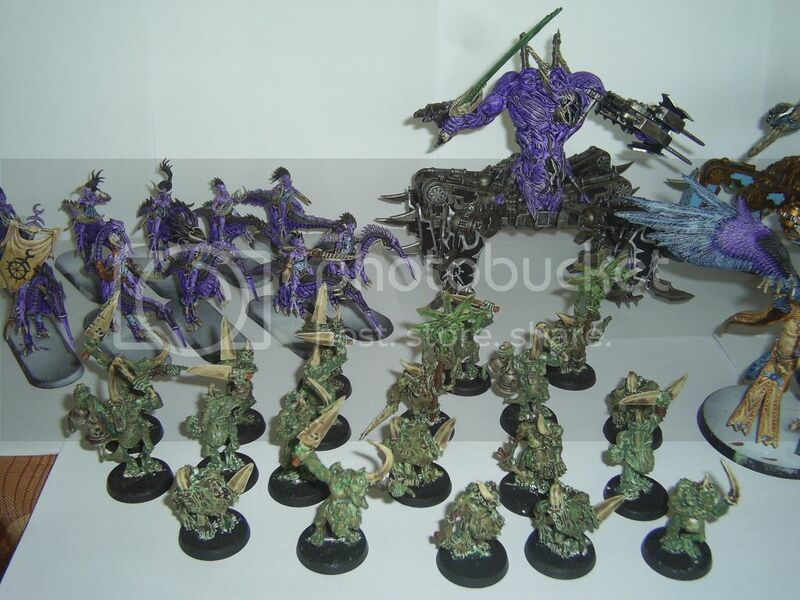 Here's my Daemon army. I've taken the easy route with it and painted it 99% using washes, inks and drybrush with the exceptions of some freehand drawings and some lining here and there (the idea about washes came from my roommate). All in all I' ve spent a little over a month in part time painting so as a slowa*s painter I'm really proud of myself . 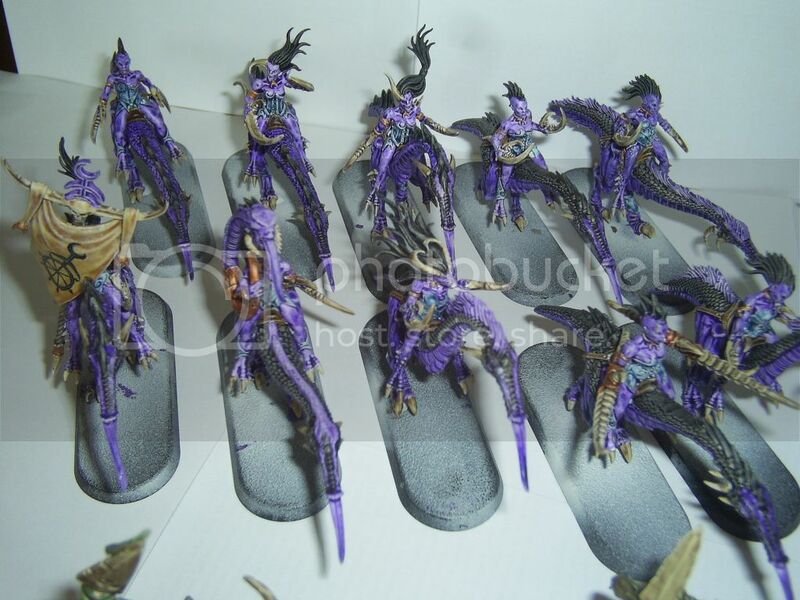 Their bases are not done yet but I've ordered some Anacrhy crystals and Black Battleground basing. Custodes Ignis Sancti, or Keepers of the Sacred Fire, the Blue Eyed Angels. In all, or at least most of, their glory. Basic metal lord, I did a head swap, and added an older raptor backpack. 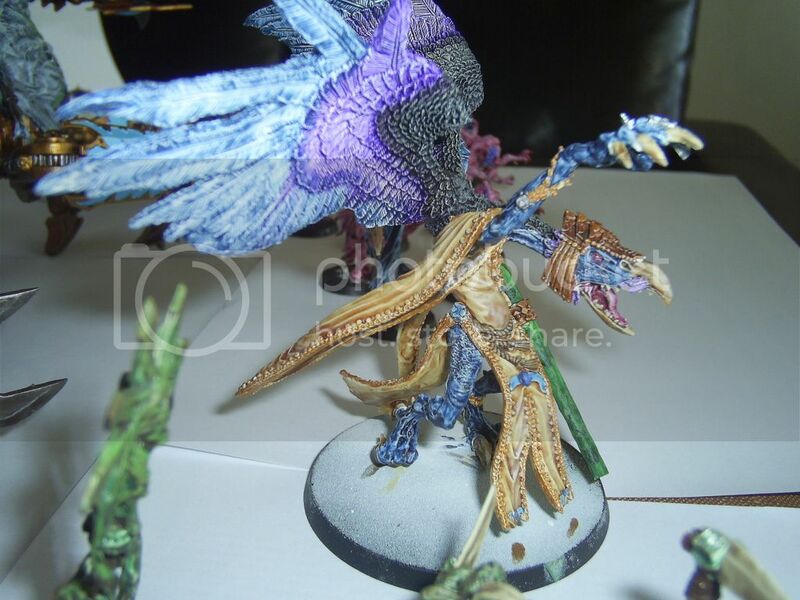 A daemon prince, made from a Inquisitor scale navigator model. Plasticard for wings. 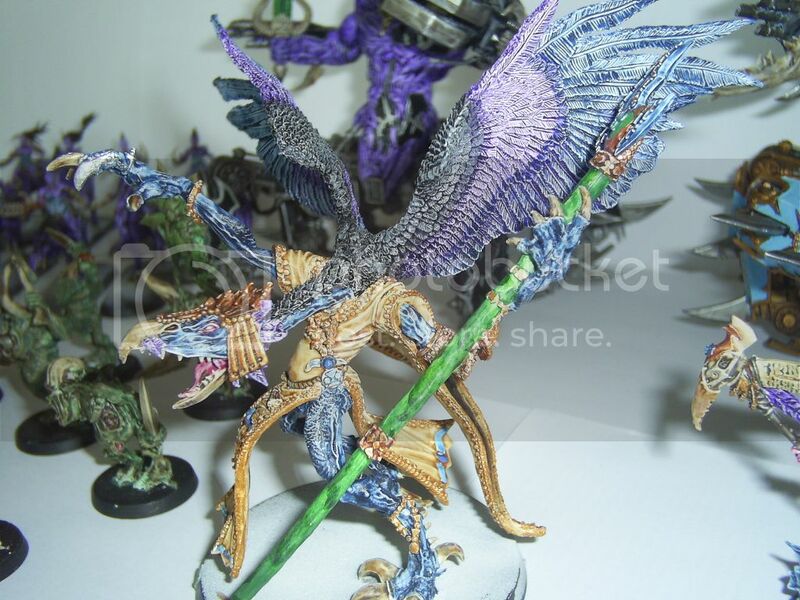 Old dark angel whatnot, turned into my Sorcerer Lord. Converted plague marines. Or at least some of them are converted. Bunch of tacticals and havoc. Huh, I really went nuts there. 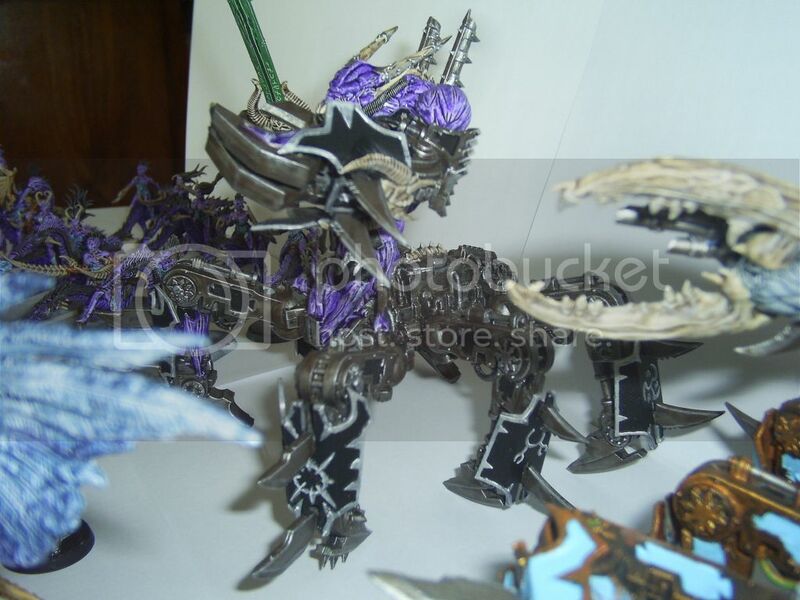 Khornate Rhinos, yay for the return of destroyer blades! And the 'zerkers who ride them rhinos. Tzeentchian rhino, for some reason. My dreadI mean Hellbrutes. Damn. Anyway, other from FW, other a conversion from the loyalist dred. 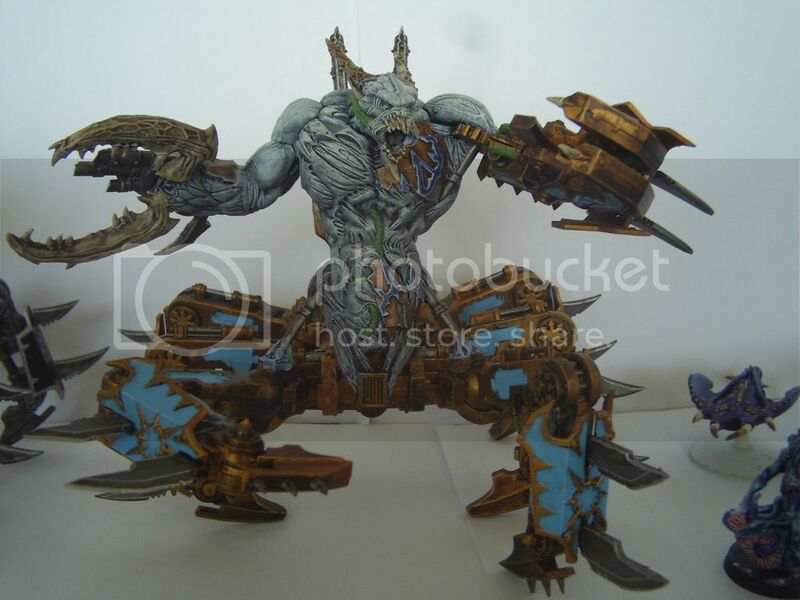 And my beloved defiler with a unphotoshopped pic with the paper edges still showing. so, time to show off some of my models... Thousand Sons! Of course, these guys need a pretty ride. 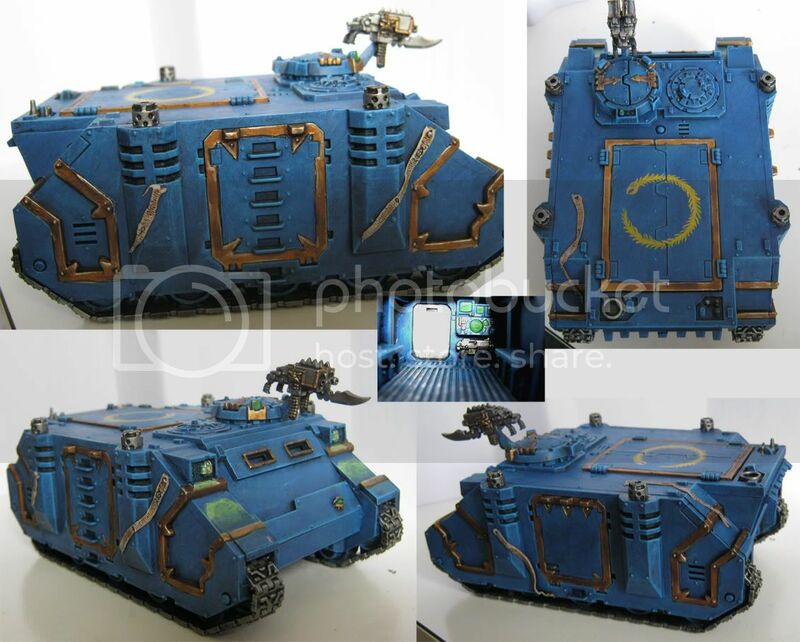 I don't think thousand sons would go with all spikey bits everywhere, so I figured out a different way to chaosify the rhino. I should probably dirty it up a bit more, with battle damage and dirt (maybe some snow in the tracks), but I can't be bothered yet. Finally, to round out the heavy support, some obliterators. 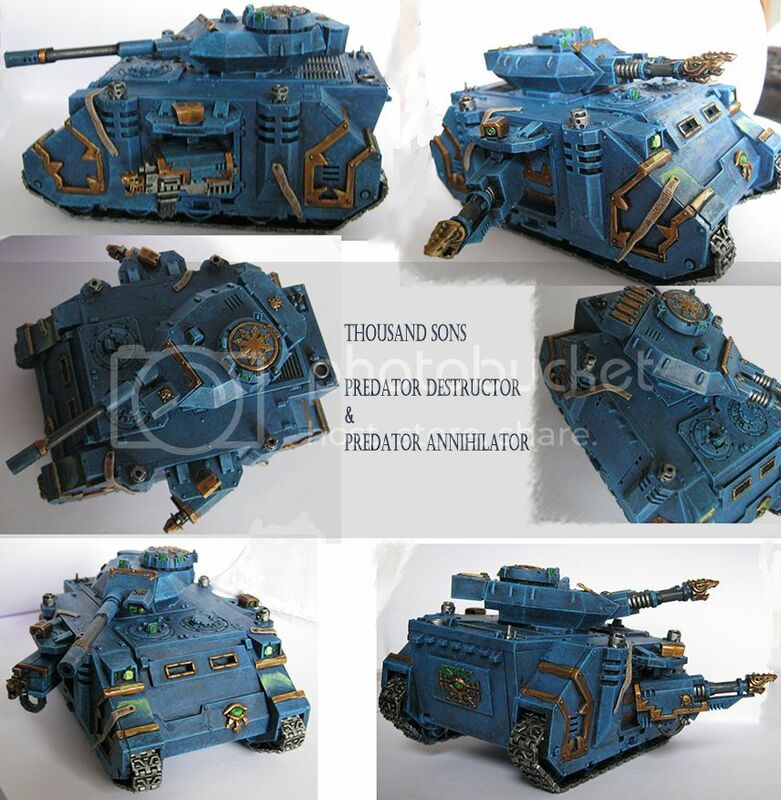 Since actual oblits don't really fit with the Thousand Sons aesthetic... well, what else has a 2+, 5++, and shoots all kinds of weird weapons? Spellcasting terminators! 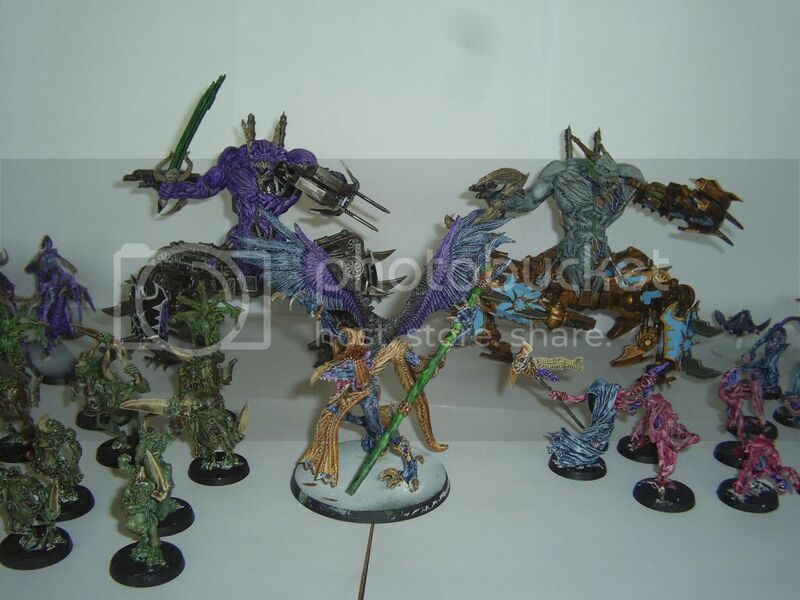 Vonny you've absolutely got the Thousand Sons to perfection. That cold blue combined with the green eyes and the gold is just stunning. They look incredible. 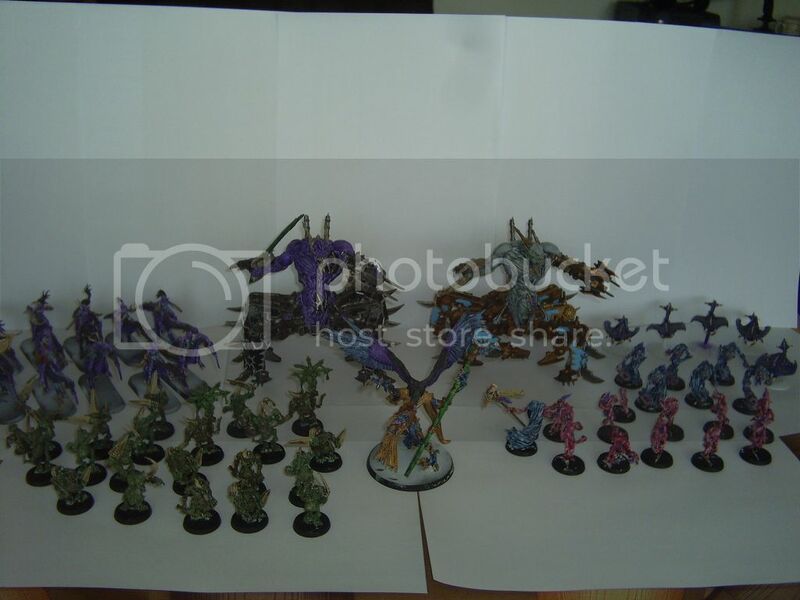 My particular stand outs are the Sorcerer next to Ahriman and the Sorcerer type Obliterators. 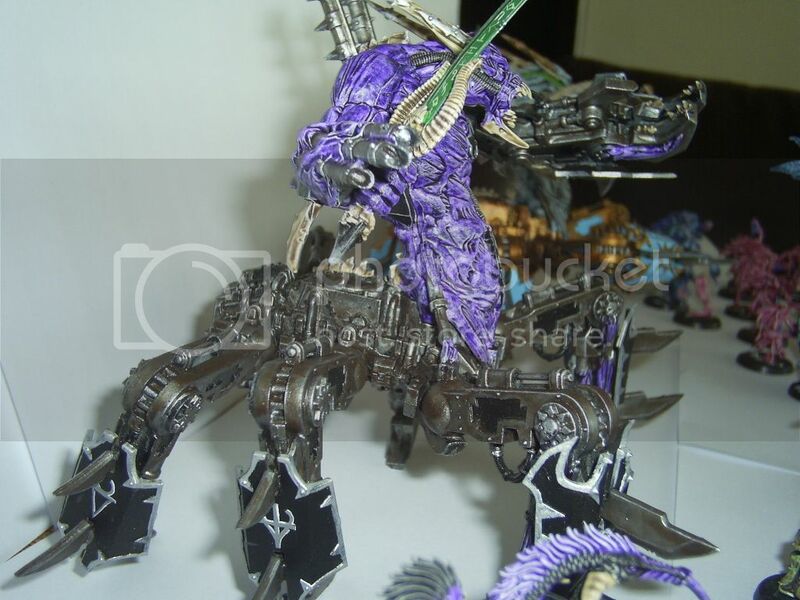 The latter in particular is an excellent idea and they look excellent; far superior to GW's Obliterator models. I like the way you think . Simply beautiful. Great idea with the obliterators. Very unique and fits the theme perfectly. I'm very excited to see where you go with this army. This is LEGENDARY. What is this hidden enclave of painting goodness that I've discovered. Dear lord Vonny these are fantastic! Wow the color balance is sick! The yellow and gold (so hard to pull off) and white look sooo good. That pale gold is just phenomenal. Aehriman is particular is a show stopper. Anyway, damn Vonny this is just great. Keep up the great work and make sure you keep me posted, I'd hate to have missed this! 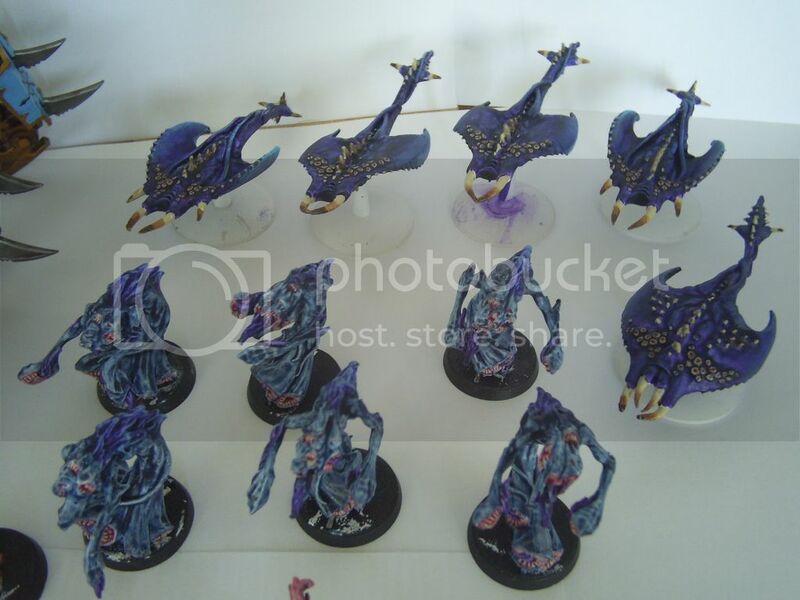 @Cav: These are just the basic thousand sons from GW, with some greenstuffed scrolls on them. Posing does a ton of work. 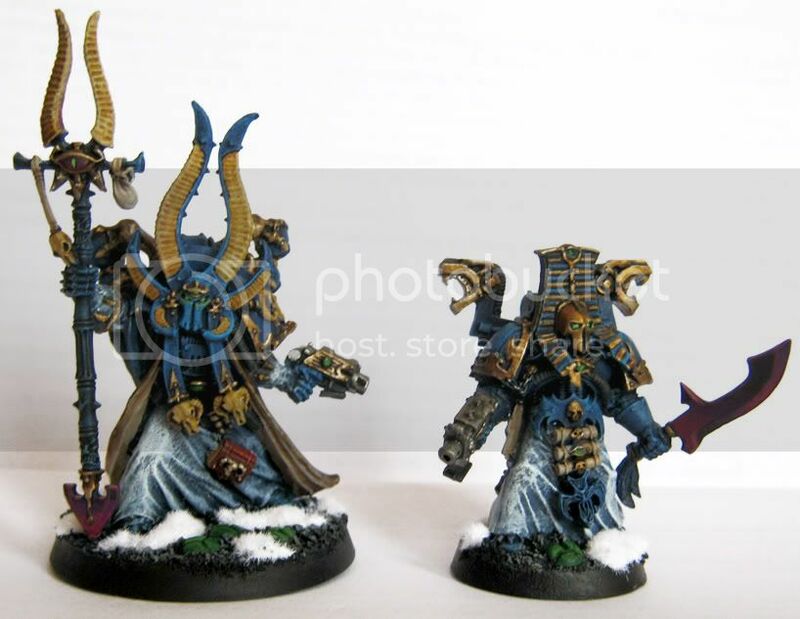 Ahriman is GW's model, and the oblits are the terminator sorceror kit combined with some dark angels parts from their upgrade sprue and an old metal terminator lord. 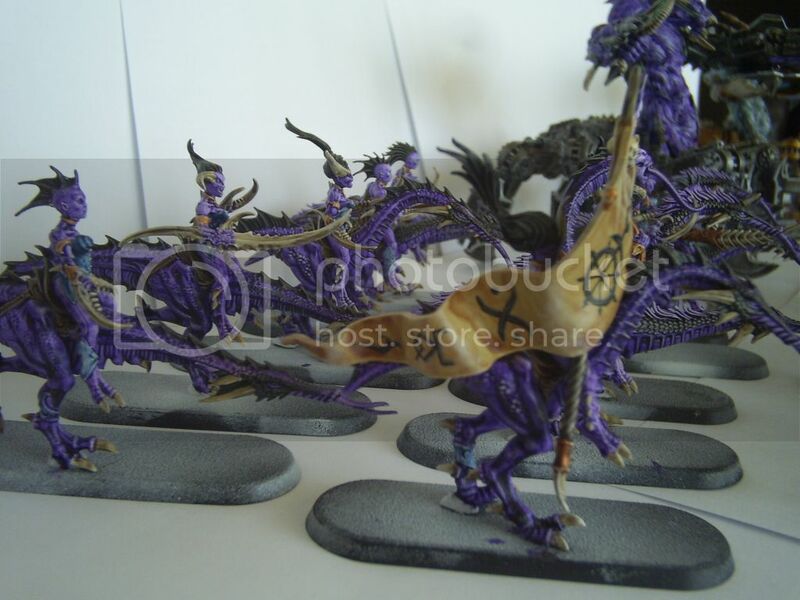 Oh, and the weapon on the aspiring sorc next to Ahriman is from the old fantasy grave guard kit (vampire counts). 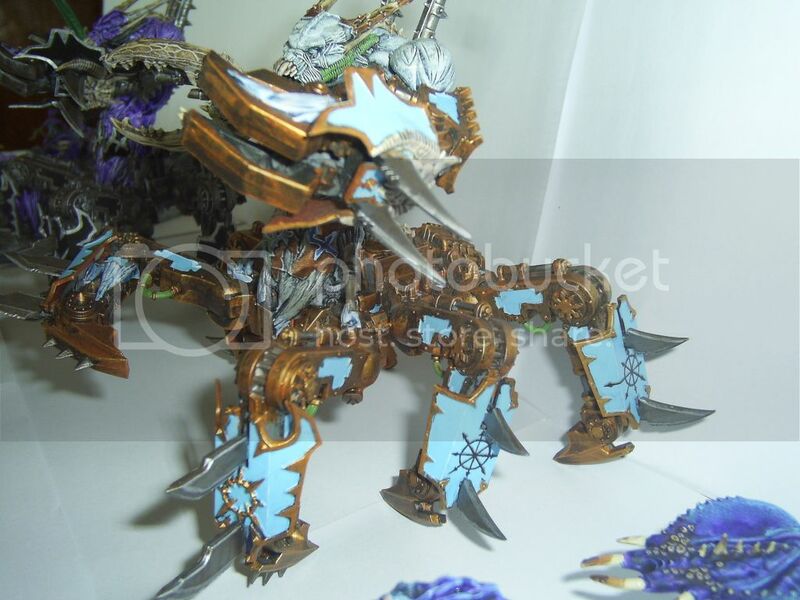 The rhino's are just basic with some scratched in lines and greenstuff to make the gold banding. Gorgeous army, Vonny. They put my beat up old Ksons to shame, no lie. 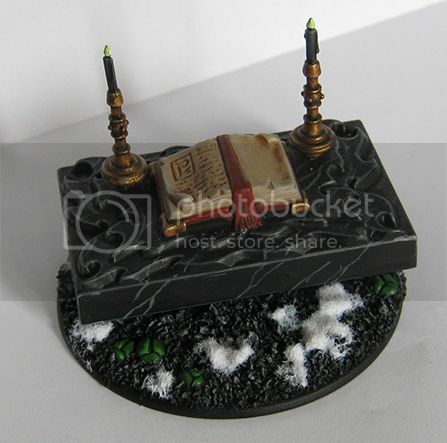 I really like that marble effect on your alter Vonny. And that blue blending on your troops and vehicles is great. 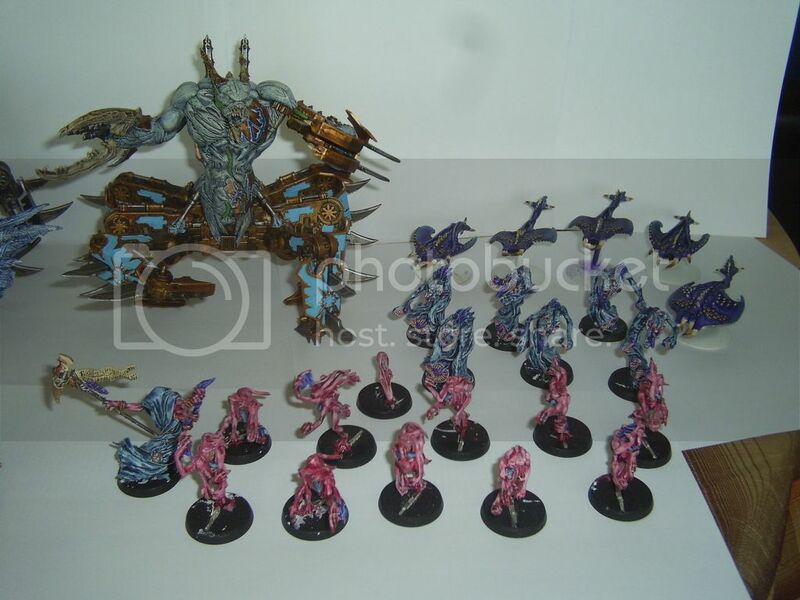 This motivates me to post some recent pictures of my chaos army.